While waiting for the presentation to start, a fellow standing nearby noticed the plate under my arm. He said that he'd heard that a collector was going to be showing up, and identified himself as a collector of trains (and therefore someone who could understand a collector's motivations). We chatted for a while, and he asked a few sharp questions about the design. Eventually, I discovered that he was none other than Dean Potter, the artist who created the artwork for the plate! 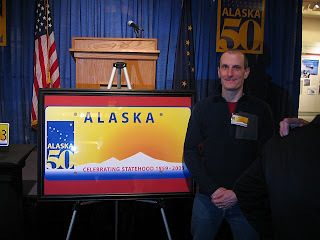 Much like Kathy Sarns, the artist who created the artwork for the Alaska Centennial license plates, Dean was gracious and friendly with the collectors. After the ceremony, I got a few more shots. 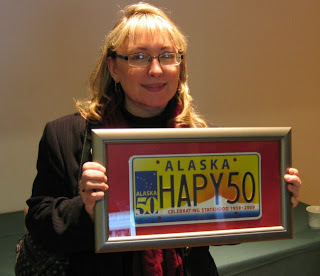 Here's Colleen Sullivan-Leonard with the Office of the Governor, holding the plate that was actually presented to Governor Palin for the ceremony: HAPY50. 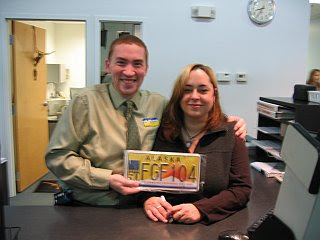 I also got to meet the new Director of the Alaska DMV, Whitney Brewster. She was also a good sport, and is shown here holding my 1959 plate (the year that we became a state) along with Dean (this time holding my own registered plate). 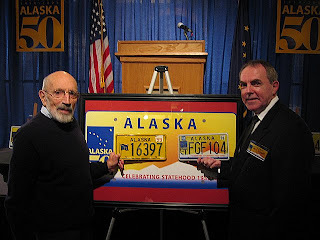 On the left is Vic Fischer, one of the crafters of our State Constitution 50 years ago, holding the 1959 (actually a 1958 plate with a '59 tab), and on the right one of the prime movers of the Statehood Celebration holding my plate. (Being only an amateur photographer, I managed to not get the name of the gentleman on the right; if someone knows his name, please let me know). While I was there, I was delighted to be greeted by another ALPCA member -- Bill Foster of Sitka. He's been collecting for some time (his ALPCA number is 2885, while mine, having joined only a couple of years ago, is 10181) and exercised one of his benefits working for Alaska Airlines to hop onto a plane and come up for the kick-off. He's full of interesting license plate stories, and it was nice to not be the only plate geek in attendance. There was also a news spot and online story on the Anchorage NBC affiliate, KTUU. 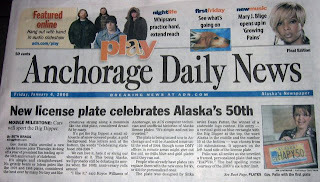 It's nice to see plates getting some news! I look forward to seeing this plate on the road for the next two years. 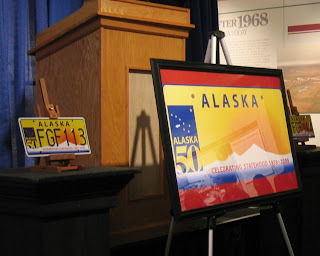 This plate, celebrating the 50th anniversary of Alaskan statehood, became available January 2nd, 2008. These are the 'general issue' plates (given out to anyone needing license plates) until the end of December, 2009. 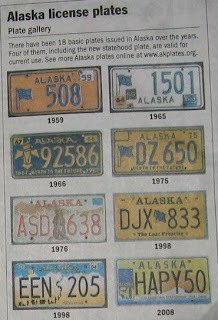 This fetching design is also available as an Alaska personalized plate for passenger vehicles. They will not be available for motorcycles, as there wasn't enough room for both the logo and six characters. Where the FGF prefix falls into the current number sequence on the roads today is interesting. 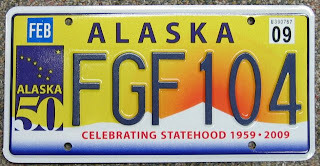 Within the fully-embossed Alaskan F prefixes run, Alaska had already started on FG* (I've spotted FGA on the road and know of issued FGBs). I'm almost positive, however, that that FGC through FGE will not appear until 2010. Some other features of this plate are worth noting. You'll notice that the word ALASKA at the top is not embossed, even though Alaskan plates have been recently moving towards full embossing. Since the font used for the ALASKA at the top is exactly the same as the font used in the official logo on the left that's used for the entire Celebration, we might speculate that the Commission graphic designers required that it match the word ALASKA in the official celebration logo. Creating new dies to match that font would have probably been more expensive. You'll also notice that the letters and numbers are in an uninterrupted string, with no space, flag, prospective gold miners, bears, totems, university logos, or anything else in between. This is the first time (that I am aware of) that the three-letter/three-number "AAA 999" format hasn't been separated in some way. Since this base is also available for personalization, there is potential for some confusion between issued and personalized plates. 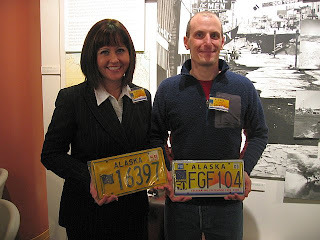 If you're in Anchorage tomorrow (may not be likely) and want to see the official kick-off of the plate (may be even less likely), it's at the Anchorage Museum at 1:00pm on Thursday, January 3rd. 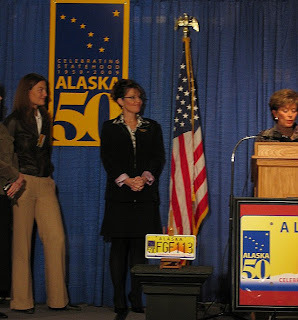 More details (including a PDF of the invitation can be found on the official Alaska Statehood Celebration Commission site. May this one fare as well! Rather than subjecting my friends and family to license plate trivia, I'll be moving my Alaskan license plates activity to this new home.